A long, flat line ran across the screen of the electrocardiogram. For Jonathan Bartels, RN, it felt as if gravity had doubled. He stood motionless with the rest of the emergency department team, their shoulders stooped and their heads hanging low to their chests. The team was not unfamiliar with the vacuous feeling that often accompanies a patient’s passing. Every one of them had lost dozens of patients before and were not ignorant of the fact that death is always looming in the emergency department. For Bartels, though, this time was different. Slowly and with confidence, a chaplain sauntered to the bedside and asked the staff in the room to stop what they were doing. A soft silence fell on the room. The chaplain began uttering a brief prayer over the patient’s body. It honored the patient’s life and the practitioners who had struggled to delay her death. The staff in the room reflected, and not long after, dispersed almost in unison. Bartels began conducting The Pause—an increasingly common custom where hospital staff takes a moment to honor the life of a deceased patient—regularly with his colleagues at the University of Virginia Health System. As the then-unnamed, localized act of respect gained momentum, Bartels secularized it to fit the diversity of the patients and practitioners it served. Then, he published an editorial in Critical Care Nurse called “The Pause,” giving a name to a practice that is now becoming a phenomenon across health systems. For many doctors, compassion is a difficult problem. There’s an industry-wide understanding that emotional intelligence is a cornerstone of quality patient care. But doctors are taught early in their careers that they must push through emotional pain and exhaustion, and that weaving emotions together with duty can wreak havoc on their wellbeing. Dulling the emotions can leave physicians feeling robotic. Desensitization lurks around every corner in hospitals. Physicians in emergency departments, hospice care, and trauma bays see death daily, so it’s no surprise that some end up feeling jaded and find it difficult to wrestle with the fact that they’re dealing with human lives, according to Angelique Campen, MD. Campen agreed that the ICU’s swift tempo is part of what makes The Pause so difficult—and important. “With how busy emergency departments are, you can’t take a break. It’s fast-paced, and there are a lot of people in the room [when a patient dies]. If it’s unexpected or a child, it’s a little more dramatic, and it can take a toll on the staff,” she said. After one such unexpected death, Perez Protto watched an attending physician collapse in a hospital hallway from grief and exhaustion. A nurse asked nearby staff to rest for a moment so she could say a few words in an impromptu version of The Pause. After she regained her bearings, the physician stood up and thanked her for it. As an emergency medicine physician and professor at UCLA, Campen said that taking a moment to reflect on a death helps her remain grasped on the human side of her occupation. She practiced The Pause prior to knowing the tradition had a name and said she recommends it to her students to help them bear the burden of death-telling. It can be meaningful for doctors who become attached to terminally ill patients, too. “After a struggle to save a patient, that loss is palpable and visceral,” Bartels said. “You feel it in your gut.” For physicians who forge connections with patients, and then must watch them die, a moment to pause and pay respect can help them fill that void. The Pause is like a breath of fresh air—or like coming up for air when you’re drowning, doctors told MD Magazine. In a medical landscape where “burnout” is uttered as commonly as vitals are taken, The Pause offers tremendous potential to help doctors and hospital systems make the most of their time and resources. Medicine has traditionally viewed death as a failure—a failure to treat, to cure. But The Pause, Bartels said, is intended to correct the disconnect between what’s inevitable, and what’s an error. When a patient dies at Cleveland Clinic, more and more doctors and nursing staff are leading the room in The Pause, Perez Protto said. They acknowledge the patient’s humanity and the efforts by the team to care for the patient. The goal is to help the team comprehend that their efforts were not in vain and that death shouldn’t be viewed a failure, but a lesson. He’s glad that more people are harnessing the healing potential of The Pause, but argues against its mandatory implementation across health systems. “If a staff member opts out, that is OK. If a family declines the practice, then that should be respected. The language used should [be] humanistic language. Avoiding religious terminology that divides or imposes should be avoided at all costs,” he said. This is another reason why The Pause has been so powerful for Perez Protto. It’s not a policy at her facility, but a “culture change.” She said even those who were originally resistant to trying it have come around after experiencing it for themselves. At Cleveland Clinic, the staff developed a loose script for physicians in instances where The Pause would be used, should physicians feel it is necessary. 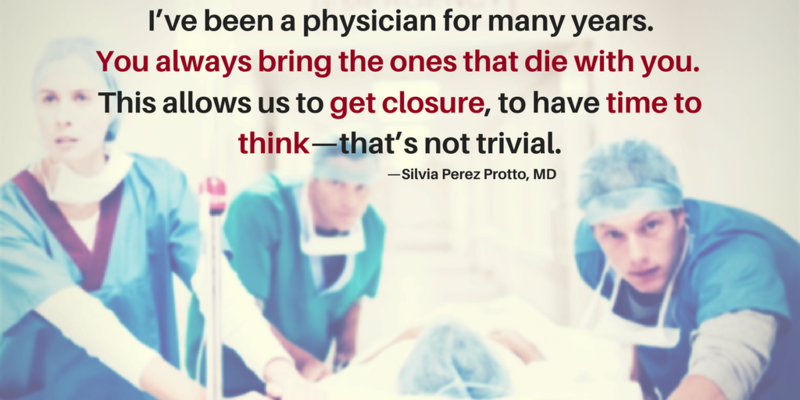 Prior to the introduction of the practice, Perez Protto said physicians inevitably turned somewhere to deal with the grief, but too often they did it alone. The Pause, she said, gives clinicians a moment of breathing and mindfulness, but more importantly, the ability to continue to their next patient refreshed and present. Grief consists of 5 stages, according to the late and acclaimed psychiatrist Elisabeth Kübler-Ross, MD: denial, anger, bargaining, depression, and acceptance. By the nature of their occupation, physicians are often forced to move through these stages at tremendous speeds, and the rates of depression in the field suggest that many never reach acceptance. It would seem that those who provide the care often do not receive care themselves. While it certainly cannot provide all the support they need, The Pause might be able to help.